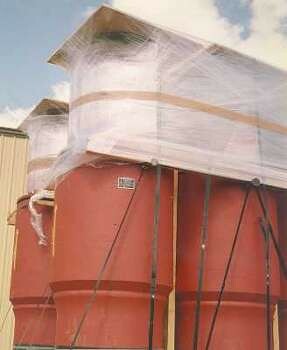 The externally pressurized expansion joints are 37.5″ in diameter and 36″ face-to-face. 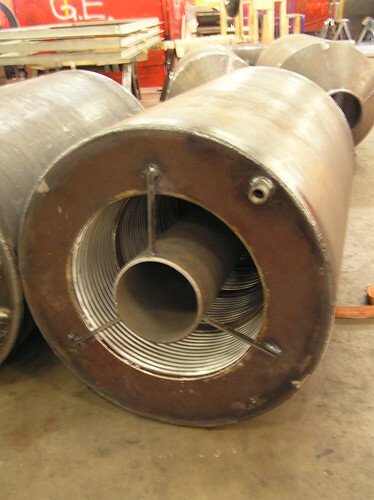 The bellows are 304 stainless steel, and the flange and ring are carbon steel. This expansion joint is rated for 232 psig with 5″ axial compression and temperatures up to 189°F. All bellows longitudinal welds were 100% x-rayed, all carbon steel welds were dye penetrant examined and each unit was hydro-tested to 348 psig. A total of 56 units were fabricated for a cooling system in a new university for women in the middle east. These externally pressurized expansion joints are 16″ in diameter and 60-1/4″ face-to-face. The bellows are fabricated from 304 stainless steel, and the rest of the expansion joint is fabricated from carbon steel. They are custom designed for 8″ axial movement and 150 psig at 176°F, with a spring rate of 2,152 lb./in. Each expansion joint was hydro-tested, radiographic tested, and dye penetrant tested prior to shipment. 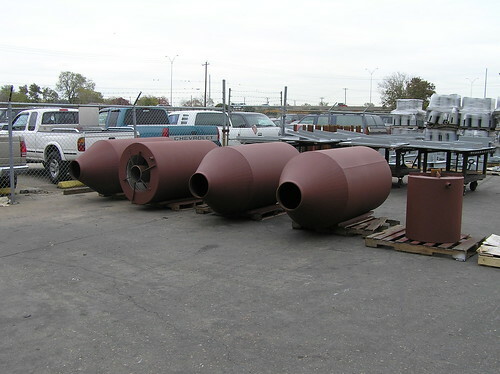 These externally pressurized expansion joints were designed in various sizes for NASA. 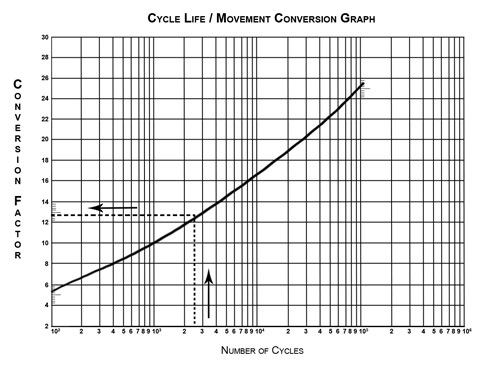 The diameter ranges from 4″ to 10″ and the overall length ranges from 21″ to 42″. The expansion joint assemblies were fabricated with 304 stainless steel bellows and 300 lb. carbon steel flanges. The design conditions were 200 PSIG at 500ºF. Externally pressurized joints are unique in that they can absorb large amounts of axial travel. They also incorporate internal guide rings that serve as limit stops in case of anchor failure. 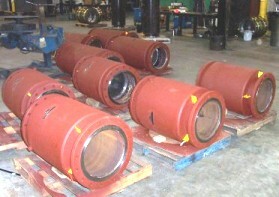 The expansion joints were 100% dye-penetrant examined and hydro-tested prior to shipment. These 15 pressure relief safety valve connector expansion joints were manufactured from 316SS, A-335 P22, A-387 Gr22, A106, and A-51670. They were externally pressurized to prevent steam blow back. These externally pressurized expansion joints were attached to the relief valves in the power plant. They assist in maintaining pressure as well as provide for 7 axial and 6 lateral travel. These joints can handle applicable loads of up to 150 PSIG at 535F and 460 PSIG at 885F, but can function if temperatures reach 1,000F. They range from 30 to 85 in length and weigh between 400 lbs and 1,600 lbs. Dye penetrate, air, and soap bubble tests were completed for quality and performance assurance. 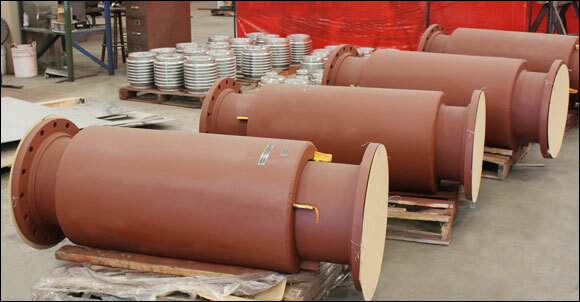 U.S. Bellows/PT&P specially designed and fabricated 40 externally pressurized expansion joints for the piping system of a steam plant in Kent, Ohio. The sizes of the expansion joints ranged from 10 to 24. 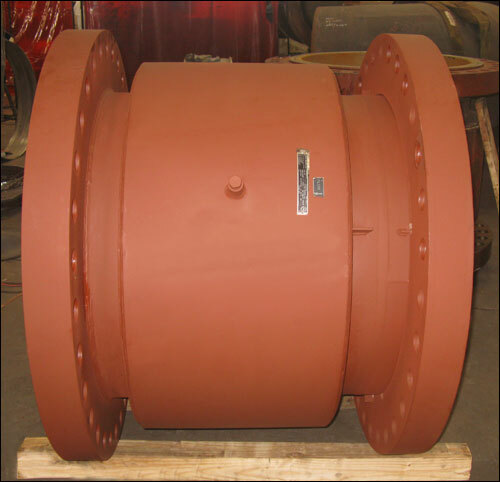 The expansion joints were designed at 150 psig and 350oF for maximum of 4 compression, and fabricated with 304 SS bellows and carbon steel shell and flanges. The joints were leak tested before shipment. These expansion joints were designed for 13″ movement. They are capable of withstanding temperatures of 1100F. These particular joints are externally pressurized. Externally pressurizing a bellows eliminates squirm as a limitation to the design and permits the safe acceptance of large amounts of axial thermal expansion.